Home » Real Estate Teams » How Can a Real Estate Company Improve Customer Service? No Comments on How Can a Real Estate Company Improve Customer Service? Listening is the key to any functioning business. The number one thing that leads to great customer service is great communication. Listening to clients needs is key to giving them a great buying/selling experience. It is also the key to getting future referrals from them. But it should not just stop at listening to clients. Listening is the key to real estate teams being effective, together. An open line of communication between, agents, office managers, brokers, and admins is critical. The more intentionally a team listens to one another, the better the clients’ experience will be. This one may seem obvious, but it’s easily the most important, and most often missed, an aspect of great customer service. This goes beyond using a calm voice and holding your tongue. Empathy is a must for dealing with buyers. First-time buyers know very little about the home buying process and will often try to make rash, uninformed decisions based on outside research. This can become increasingly frustrating, but if you realize they don’t know any better and use your hard-earned knowledge to put them back on the right path, eventually they will see why you are right and will appreciate your patience. The same can be said for a team. There is always THAT person in the office. By being kind and patient, a multitude of arguments and miscommunications can be avoided. Stand out amongst other agents by showing you know your material. Agents should immerse themselves in every facet of real estate, including the obscure facts regarding their market. Use all the tools available to you to learn your market inside and out. Instead of letting clients be content to use automated or digital problem-solving tools, agents should make clients feel comfortable that every solution to their problem can come from them. Customers like to be remembered. Whether its a personal detail or a specific issue they had, they don’t want to repeat themselves and like to be remembered. If it’s personal details an agent is looking for, a simple lunch meeting will get you some information worth remembering. If a client comes to you with a problem over a period of time, remembering exactly what the issue is will not only help the problem solve itself quicker, but will make sure they come back to you in the future. Remembering is important for teams, too. Remembering the details about co-workers leads to better morale and customer service. Likewise, remembering where co-workers shine and where they struggle allows teams to play into one another’s strengths. text or an email inbox should not be a company’s only avenue for customer service. Businesses that rely on this format miss out on the face-to-face interactions that go with solving someone’s problem. Email is great, but inboxes fill up, get improperly sorted, or accidentally get deleted. Past threads also get lost. Texts often get forgotten and aren’t tracked for the whole team. 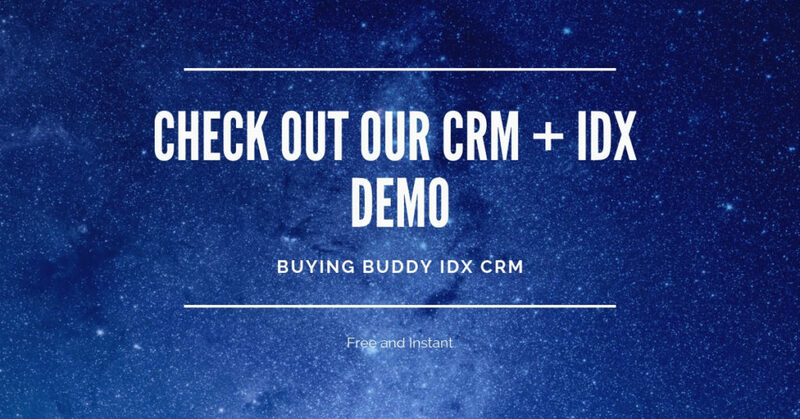 The best communication tool for the job are CRMs like Buying Buddy. Real estate CRMs allow agents to have a profile for each lead and client. They track previous communications (email, text, phone calls, etc) as well as remind agents of upcoming contact. Having this kind of communication tool will allow agents to have a direct line to any of their clients’ issues. Nobody is perfect, and clients shouldn’t expect agents to be. Mistakes are inevitable, but the best way to handle them is to own up and admit when something went wrong instead of trying to sidestep the problem. Clients appreciate honesty above all else, and most will be understanding when the worst happens. Don’t allow clients to find out on their own, either. Beat them to the punch and have a solution ready with the explanation. Depending on how big the problem may be, establish a timeline of how the problem will be fixed. For teams, it all comes from within. Agents need to be the change they want to see in the office. By owning up to their own mistakes, they create a company culture for others to be transparent. This leads to clearer communication and greater problem solving to fix chronic issues. While there are many tricks to navigating the trials and tribulations of real estate, it is in an agent’s best interest to pass their knowledge along to their clients. Finding easy-to-use tools that even a first-time home buyer can use, will make them feel empowered. Clients begin to answer their own questions. This, in turn, will free up an agent’s time to solve the bigger problems when they arise. For teams, there is always a list of 10 things to complain about. Watching co-workers underperform is annoying. But by sharing knowledge and teaching one another, problems get solved and clients get quicker solutions. Finally, the last thing to keep in mind is the real estate industry is changing on a daily basis. Agent’s need to be prepared and adapt to the technology and fluctuating markets. Keeping up to date with apps, CRM’s, and other home showcasing tools, and how they allow better problem solving, will prove invaluable over time for an agent and their team. Focusing on customer service is the surest way to increase referral rates. This is the number one source of real estate clients. By listening, being kind and patient, being the most knowledgeable, remember the details, using the right tools, owning and fixing mistakes, being a teacher, and planning for the future allow real estate companies to offer the best customer service. It boils down to character. And, it boils down to being intentional.